From the Runway watch collection, this stunning watch proudly displays your love for Michael Kors®. Silver-toned ion-plated stainless steel bracelet with deployment buckle. 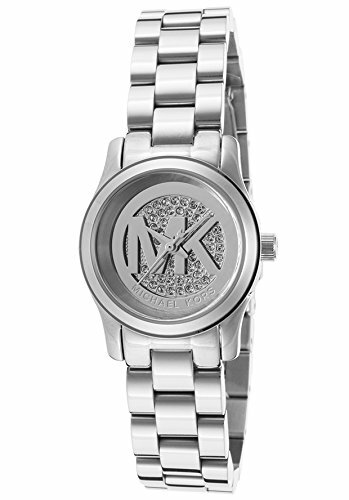 Silver-toned dial with silver-toned hands and large MK logo. Quartz movement. Water-resistant up to 50 meters. Imported. Measurements: Case Height: 26 mm Case Width: 26 mm Case Depth: 10 mm Band Width: 6 mm Band Circumference/Length: 8 in Weight: 3 oz This product may have a manufacturer's warranty. Please visit the manufacturer's website or contact us at warranty@support.zappos.com for full manufacturer warranty details. From the Runway watch collection, this stunning watch proudly displays your love for Michael Kors®. Silver-toned ion-plated stainless steel bracelet with deployment buckle. Silver-toned dial with silver-toned hands and large MK logo. Water-resistant up to 50 meters. Imported. Measurements: Case Height: 26 mm Case Width: 26 mm Case Depth: 10 mm Band Width: 6 mm Band Circumference/Length: 8 in Weight: 3 oz This product may have a manufacturer's warranty. Please visit the manufacturer's website or contact us at warranty@support.zappos.com for full manufacturer warranty details.